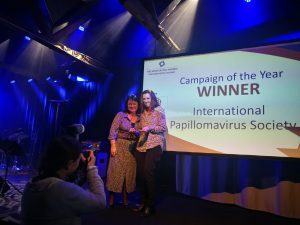 At the recent International & European Association Award IPVS took first prize in the Effective Voice of the Year campaign category with the inaugural HPV Awareness Day global campaign, launched in 2018. IPVS was nominated alongside Union for International Cancer Control (UICC) and World Heart Federation (WHF) at this annual award ceremony and received the award in recognition of the effectiveness and global reach of HPV Awareness campaign launched in 2018. #GiveLoveNotHPV reached millions of people, providing key information about HPV prevention and management which was seen as the foundation of achieving the society’s ultimate goal of eliminating HPV and associated cancers. “The human papillomavirus, HPV, is responsible for around 1 in 20 cases of cancer worldwide, affects all of us and yet has very low public awareness. 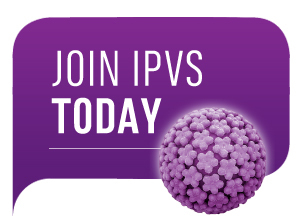 IPVS believes that sharing information and starting conversations about HPV is critical to changing attitudes, behaviours and saving lives. We are delighted with this recognition that our inaugural campaign has put us on the right track,” added Prof Margaret Stanley, President IPVS.